Environmental DNA (eDNA) is increasingly being used in aquatic environments for monitoring species, particularly those that are of conservation concern and/or are difficult to visually observe. Quantitative PCR (qPCR) has been employed to detect low abundance species occurring in environmental water samples. However, the qPCR technique has principally been applied to freshwater habitats, with less application to pelagic marine environments. We developed a species-specific eDNA assay for the Chilean devil ray, Mobula tarapacana, to assess the capability of using eDNA to detect transient pelagic marine animals. For this pilot study, seawater samples taken at seamounts around the Azores (NE Atlantic) were tested to determine the suitability of this approach for detecting the target species. Samples were taken at sites where M. tarapacana has been previously observed, in addition to sites where its presence is not known. eDNA detection was compared to observations carried out on the same day as water sampling. The qPCR assay successfully detected M. tarapacana at four of five seamount sampling opportunities where the species was observed, and there is a statistically significant relationship between genetic and visual detection. Target DNA was found at one location between seamounts in the absence of visual observation. Our results highlight the importance of physical environmental factors in relation to sampling eDNA in the ocean, such as currents and eDNA dispersal ability. 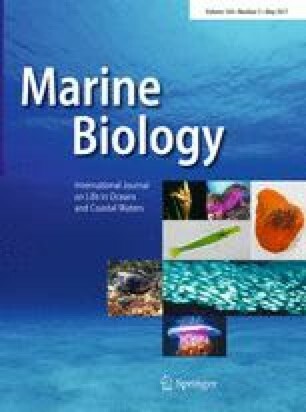 This method has been shown to be sensitive for detection of M. tarapacana DNA in seawater and, therefore, in the identification of important seamounts requiring conservation. Reviewed by J. Shaw and an undisclosed expert. The online version of this article (doi: 10.1007/s00227-017-3141-x) contains supplementary material, which is available to authorized users. This project is part of LMG’s Ph.D., with funding from University College Dublin. Additional funding was made available by IFCT Exploratory Project (IF/01194/2013/CP1199/CT0002) and ACORES-01-0145-FEDER-00056 MAPGes. This project has received funding from the European Union’s Horizon 2020 research and innovation programme under Grant agreement No. 678760 (ATLAS). This output reflects only the author’s view and the European Union cannot be held responsible for any use that may be made of the information contained therein. The authors would like to thank Damian Egan for assistance in primer design and qPCR optimisation. They also gratefully acknowledge Edward Farrell and Bernard Seret for providing the tissue samples used to optimise the qPCR assay, as well as Pedro Afonso, Jorge Fontes and Sérgio Gomes for Mobula tarapacana tissue samples and for assistance with water sample collection. TM is supported by Program Investigador FCT (IF/01194/2013), FSE and MCTES, through POPH and QREN. They also thank the reviewers for their helpful comments and suggestions to improve the manuscript.